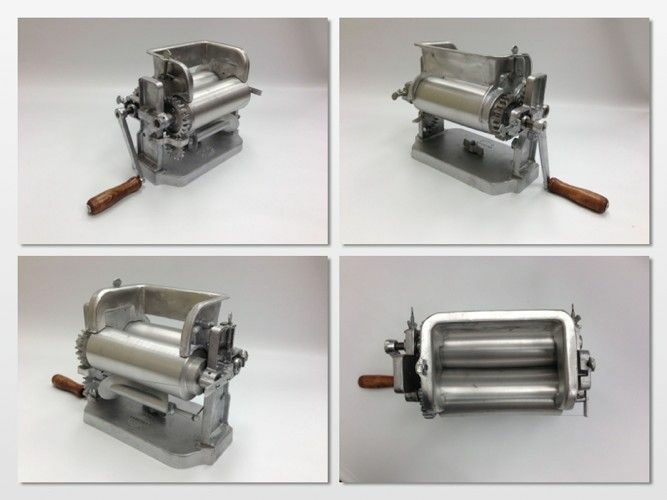 Tortilla Press for Mexican food restaurants is built of cast aluminum. The perfect cooking tool to make 6" tortillas using masa dough, just put the masa dough balls in the middle rollers, turn the handle rotation and it rolls the tortillas out, then you place the uncooked corn tortillas in a hot comal or griddle to cook. You can adjust the thickness of the tortillas manually as needed in your Tortilla roller press. 1) Simply take out of it�s box. 2) Put the handle in screw, moving it towards you. 3) Put Freshly made Dough (masa) on top or rollers. 4) You can adjust how thick you would like your tortilla by simply moving the adjusters in the back. 5) With your left hand grab the handle and start spinning handle towards you. 6) With your right hand press the dough while you spin the handle with your Left hand towards you. Caution: When pressing the dough be careful not to put the fingers between the rollers. 7) The Tortilla Machine will start cutting the dough in a tortilla shape of 5" diameter and presenting it infront of you. 8) Simply grab the tortilla shape dough and put it on hot skillet (comal) until the dough is cooked. 10) To make a lot of tortillas simply repeat steps 5 thru 7. Unfortunately, there is no DVD or documentation with this. I've found it several other places with the DVD and at a lessor price, by the same manufacturer. It arrived in good condition. Once you figure out how to use it, it works fine. I've not yet been able to find the discs in other sizes. It does a good job once you learn how to use it. I am disappointed with the manufacturing quality of this product. However, it really does work. Once you get the masa to the right consistency, it churns out perfectly formed tortillas. They are perfectly round and of perfectly even thickness. And it produces them fast! If you need to make dozens of tortillas, this is the way to go.